TROON, Scotland -- Henrik Stenson kept hitting the best shots of his life, one after another, because there was no other way to beat Phil Mickelson in a British Open duel that ranked among the best in golf. Stenson only cared about that silver claret jug. He wound up with so much more Sunday. His final stroke of this major masterpiece was a 20-foot birdie putt on the 18th hole at Royal Troon that tumbled into the cup on the last turn. His 10th birdie of the round gave him an 8-under 63 to match Johnny Miller for the lowest closing round by a major champion. Stenson finished at 20-under 264, the lowest 72-hole score ever in a major. He tied Jason Day's record for lowest under par set last year at the PGA Championship. Records didn't matter. This was about winning his first major. "I didn't know until they told me in the recorder's hut," Stenson said when asked if he knew that last putt was for 63. Stenson won by three shots over Mickelson, a runner-up for the 11th time in a major, but never like this. Lefty played bogey-free for a 65 and posted a score (267) that would have won all but two Opens over more than a century. "A 65 in the final round of a major is usually good enough to win," Mickelson said. Stenson held the claret jug and told Mickelson at the closing ceremony, "Thank you very much for a great fight." Mickelson said it was the best golf he ever played without winning. "You know he's not going to back down and he's going to try to make birdies on every hole," Stenson said. "So I just tried to do the same, and just delighted to come out on top and managed to win this trophy." This was heavyweight material, reminiscent of the "Duel in the Sun" just down the Ayrshire coastline at Turnberry in 1977, when Tom Watson and Jack Nicklaus battled right down to the final hole, and no one else was closer than 10 shots. Stenson and Mickelson were never separated by more than two shots over 40 straight holes until the Swede's final birdie. Mickelson led only once, a two-shot swing on the opening hole. They were tied with five holes to play until Stenson made an 18-foot birdie on the par-3 14th, and then buried Lefty with a putt that defined his moment as a major champion. Stenson hammered in a 50-foot birdie putt across the 15th green, walking toward the hole as it was on its way, stopping halfway to pump his fist when it fell, rare emotion for a 40-year-old Swede with ice blue eyes and a stare that can cut through gorse. Mickelson gave it his best shot in his bid at 46 to become the fourth-oldest major winner in history. He chased a 3-wood onto the green at the par-5 16th, and his eagle putt from 30 feet missed by less than an inch. Stenson matched his birdie with an up-and-down from deep rough, and he was on his way. "I always thought he would come through with a win," Mickelson. "I'm sorry that it came at my expense." J.B. Holmes won the B-Flight. He finished third, 14 shots behind. "Those guys are playing a different golf course than everyone else," Holmes said. Mickelson had not won since the British Open at Muirfield three years ago, with Stenson as the runner-up. Mickelson began the week at Royal Troon with a 63, and Stenson finished what Lefty started. The Swede won his first major in his 42nd attempt, becoming only the ninth player to capture his first major after turning 40. Beyond the score, the measure of his performance was that he putted for a birdie on every hole Sunday in a mild wind off the Irish Sea. Stenson three-putted for bogey from just off the first green, and he three-putted on No. 10 to fall back into a tie for the lead. They matched pars on only six of the 18 holes. 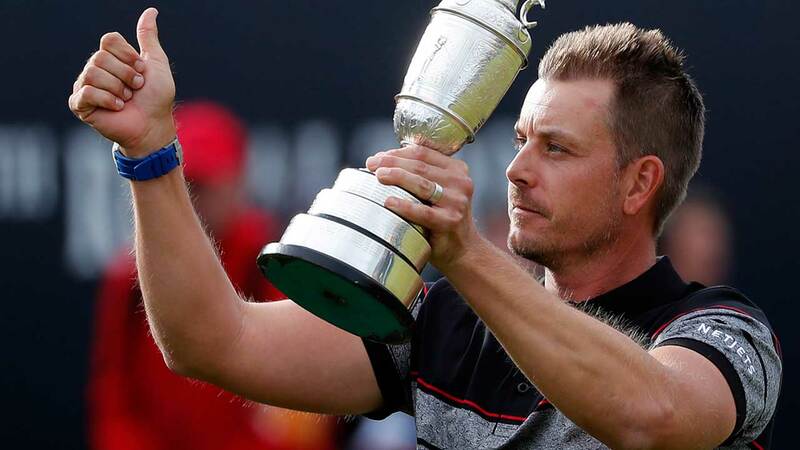 Stenson became only the fourth player to win the British Open with all four rounds in the 60s, joining Tiger Woods, Nick Price and Greg Norman. He also ended a streak of six American winners at Royal Troon that dated to 1950. He gave Sweden a long-awaited major in men's golf, 19 years after Jesper Parnevik lost a 54-hole lead at Royal Troon. Stenson said Parnevik send him a message that said, "Go out and finish what I didn't manage to finish." "I'm really proud to have done that, and it's going to be massive for golf in Sweden with this win," Stenson said. Maybe he can take that silver jug down to Rio in his search of Olympic gold. Golf's top four players have withdrawn from the Olympics, but the Rio Games will have at least two of this year's major champions - Stenson and Masters winner Danny Willett of England. There's one more major to play before Rio. Take a breath, Henrik. The PGA Championship starts a week from Thursday.